For other uses, see Kirkby (disambiguation). Kirkby (/ˈkɜːrbi/ ( listen) KUR-bee) is a town in the Metropolitan Borough of Knowsley, Merseyside, England. Historically in Lancashire, it developed from the 1950s to the 1970s as a housing overspill of Liverpool. It is roughly 5 miles (8 km) north of Huyton and 6 miles (10 km) north-east of Liverpool. The population in 2011 was 40,472. It is believed to have been founded in 870 although there is archaeological evidence for settlement from the Bronze Age. Historically in Lancashire, Kirkby is believed to have been founded circa 870, although archaeological digs have produced evidence of habitation in the Bronze Age. The name Kirk-by, from the Old Norse word elements 'kirkja' and 'byr', believed to be of Danish origin, meaning 'church' and 'settlement' or 'village'. The town's settlers arrived via Ireland around 900. The first direct evidence of a settlement dates from 1086 and the Domesday Book, with a reference to Cherchebi – population 70. Ownership of the land containing modern-day Kirkby – established as the West Derby Hundred in the 11th century – passed through many hands until 1596, when the Molyneux family purchased the hundred in its entirety. After a brief loss of patronage in 1737 as a result of the head of the family taking holy orders, in 1771 the Molyneux family were made Earls of Sefton and regained their lands. Although remaining largely farmland until the mid 20th century, initial transport links to the area began in 1848 with the building of the Liverpool and Bury Railway through Kirkby. The East Lancashire Road (A580 road) added road connections in 1935 and industrial development was being considered prior to the outbreak of the Second World War. A Royal Ordnance filling factory – ROF Kirkby – was established in 1939 and completed in 1941. At its peak, the factory employed over 20,000 workers. By the end of the war, Liverpool had suffered much damage from the Blitz and much of its remaining housing stock was poor and considered slums. In an effort to improve these conditions, Liverpool Corporation began a policy of buying land in the surrounding areas and moving industry and people to newly developed 'overspill' estates. This process culminated with the purchase of 4,070 acres (16.5 km2) of land, including the land comprising Kirkby, from the Earl of Sefton in 1947 for £375,000 (£14.4 million inflation adjusted). Kirkby would become the largest of these overspill estates for Merseyside. As development of the town grew, in 1949 Liverpool requested to have it officially designated a new town, but this proposal was rejected. Large-scale development began in February 1950 with the construction of the Southdene neighbourhood, with the first houses finished in 1952, the 5,000th in 1956 and the 10,000th in 1961. A population of 3,000 in 1951 swelled to over 52,000 by 1961, making it the fastest growing community in the UK by far. The Kirkby Urban District was created in 1958. Such vast growth caused many problems, not the least of which was that the construction of local amenities had not kept the same pace. For example, while occupation of the council estates of Southdene had begun in 1952, the first shops were not completed until 1955 and the first public house was not open until 1959. Additionally, the people who were being moved into Kirkby during this period came from the poorest areas of Liverpool. During this time, Kirkby Industrial Estate was steadily expanding to become one of the largest in England until, at its peak in 1971, the estate provided employment for over 26,000 people. Kirkby achieved independent Urban District status in 1958. This was then abolished and on 1 April 1974 its former area was combined with that of Huyton with Roby Urban District, Prescot Urban District, parts of Whiston Rural District and parts of West Lancashire Rural District to form the present-day Metropolitan Borough of Knowsley. In 1974 it was abolished and its former area was transferred to Merseyside to be combined with that of Huyton with Roby Urban District, Prescot Urban District, parts of Whiston Rural District and parts of West Lancashire Rural District, to form the present-day Metropolitan Borough of Knowsley Kirkby has been represented at the Houses of Parliament by George Howarth since 1986 first as part of the Knowsley North constituency, then as part of the Knowsley North and Sefton East constituency and since 2010 as part of the Knowsley constituency. He currently holds a 42216 majority, which makes it the second safest Labour seat in the country. He was preceded by Robert Kilroy-Silk, Labour (1974–1986), Harold Soref, Conservative (1970–1974) and Harold Wilson, Labour (1950–1970), although the representing constituency has varied due to regularly shifting boundaries. The boundaries will change once again at the next general election. Kirkby is commonly divided into four districts - Southdene, Westvale, Northwood, and Tower Hill. Its electoral wards, however, do not coincide with these divisions, and consist of Cherryfield, Kirkby Central, Northwood, Park, Shevington and Whitefield. There are 18 local councillors all of whom represent the Labour Party, who often run unopposed. Kirkby is in the European parliamentary constituency of North West England which has nine Members known as MEPs. 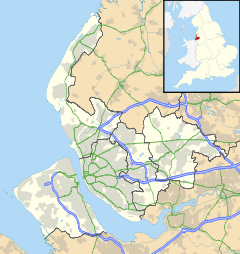 Kirkby lies 6 miles (10 km) north-east of Liverpool and lies within Merseyside in North West England. It is 180 miles (290 km) north-west of London, 5 miles (8 km) north-west of Huyton, the borough administrative headquarters. The River Alt flows through the extreme south west of the town, with the Kirkby Brook tributary passing through the centre. Due to its position near the north-west coast of England, Kirkby has a temperate maritime climate: its Köppen climate classification is Cfb. Its mean annual temperature of 10.2 °C (50 °F) is similar to that experienced throughout the Mersey basin and slightly cooler than the English average. Average sunshine hours at 1394.6 are slightly above the average for the UK of 1339.7. January is the coldest month with an average mean temperature of 4.7 °C while July is the hottest at 16.7 °C. Rainfall at 806.6 mm (31.76 in) is slightly lower than the England average of 838 mm and much lower than the UK average of 1,125.5 mm (44.29 in). October is the wettest month with an average rainfall of 86 mm (3.39 in) and April is the most dry with 49.1 mm (1.93 in) of rain. The nearest weather station of the Met Office is at Manchester Airport. The population of the town stood at 42,744 at the 2011 census. This represented just over a quarter of the total population of the borough of Knowsley and was down from its peak of 52,207 in the 1961 census, largely due to falling birth rates and the slow decline of the industrial estate, which forced workers to move elsewhere seeking employment. Housing demand has increased in recent years, however, with significant developments being built across the town. This demand can somewhat be attributed to the demolition of high-rise flats and maisonettes – built during the 1960s, but fallen into disrepair – on a town-wide basis, and the resultant need for replacement housing stock. According to statistics of the British Government, the borough of Knowsley, including Kirkby, had a population of 145,900 at the 2011 census, with a balance of 52.6% female and 47.4% male. This is down from 150,459 recorded in the 2001 census. The borough is overwhelmingly of a white ethnic background at 98.42%, against a national average of 90.9%. In order of population size, other ethnic groups are represented as multiracial at 0.83%, Chinese at 0.24%, other Asian at 0.23% and black at 0.22%. A high proportion of the town are of Irish Catholic descent as a result of historical emigration into Liverpool. The borough is mostly Christian at 85.63%, compared to the national average of 71.74%, with the next most significant grouping at 5.84% describing themselves as non-religious (much lower than the national average of 14.59%). Just 0.17%, 0.11%, 0.07% and 0.03% would describe themselves as Muslim, Hindu, Buddhist and Jewish, respectively. Below is a table outlining population change in the town since 1861. As can be seen, the population of the town had been on a gradual downward trend from 1861 to 1931 before beginning to soar when Liverpool Corporation began to develop the area on a mass scale. The annualised growth rate from 1951 to 1961 was over 30%, making it by far the fastest growing town in the country. The total population of Kirkby peaked in 1971 at 59,917, and has since seen a steady decline. Recently the town's population has been growing, though, and the town was estimated by the NHS to total around 44,120 as of 2006. Kirkby Industrial Estate, formerly ROF Kirkby, still employs many of the town's workers; the town's industrial heritage, however, has largely faded away, with service industries moving in to replace the factories. Major employers currently active in the town include QVC and Barclaycard, with several other call centre companies also based in Kirkby. This is a chart of trend of regional gross value added (GVA) of Kirkby at current basic prices published (pp. 240–253) by the Office for National Statistics with figures in millions of pounds sterling. Kirkby has seen considerable regeneration efforts in recent years. The Kirkby Sports Centre, one of the main athletic and cycling centres (velodromes) in the region, was demolished in 2007 and replaced by a new leisure facility (which excluded a track). In December 2006, a proposal was made by Tesco and Everton F.C. for an extensive redevelopment of the town centre, including a new 50,000 seater stadium for the football team and associated retail developments. The proposals also include a hotel, leisure and retail facilities. It has also been stated therein that the town's public amenities would be increased to include a walk-in health centre. But this would be at the cost of losing one of the largest open public green spaces in the town. Kirkby Market underwent redevelopment as part of regeneration plans, and reopened on 26 April 2014. The redeveloped market is fully covered and contains a cafe. The redevelopment of the market was viewed as a big step forward in the redevelopment of Kirkby town centre as a whole by residents. In 2015 the area of the town centre previously owned by Tesco was bought and taken over by St. Modwen in a £35.8m deal. St. Modwen revealed expanded plans for the regeneration of the town centre, including a cinema and a new supermarket (coming after the plans for the Tesco store had fallen through) as well as parking and leisure development. This led to reports that two supermarkets were competing to build a store in the town, and it was rumoured that one of those stores was ASDA, who by coincidence were the previous major supermarket in Kirkby, closing its doors in the late 1970s, Kirkby has as a consequence been without a major supermarket for around 40 years. A major public consultation was held with local businesses, shopkeepers and residents in October 2016. In response to this St. Modwen submitted a revised application for the town centre regeneration scheme to include the requirements of the foodstore anchor Morrisons who were revealed to be the winning bid to build a store in the town. According to local reports, Knowsley Borough Council hosted public consultation events about possible redevelopment options in summer 2007, which indicated most respondents showed they had reservations about the proposed football ground. It is claimed that a majority of people support regeneration in general, but is not clear whether residents favour this particular development, which would include a Tesco superstore, new town centre shops and the Everton stadium. Results of the public consultations have not been released into the public domain. Reports suggest local support for the Tesco/Everton F.C. scheme appears to be tempered by concern over the effect the stadium will have on residents. Public meetings about the Tesco development have also been held by local pressure group Kirkby Residents' Action Group and in other forums. These include a public meeting in St. Chad's Church, which 500 people attended, and a public march was organised to demonstrate against the stadium proposals. The action group was formed to campaign for a referendum of the people of the town. It appears that public opinion is not clear as to support for or opposition against the proposals for a Tesco/Everton F.C. development. Another action group called Kirkby Residents In Support of Progress (KRISP), which supports the scheme, was formed specifically to back Tesco's claims about the development. However, KRISP has not been heard of since the inquiry ended. Knowsley MBC Planning Committee were 'minded to approve' the Tesco/Everton F.C. scheme and the decision had been made by UK Government to 'Call it in', which led to a public inquiry. All sides gave evidence and await the inspector's recommendations. The decision may not be made until November 2009. It now seems that the majority of residents who voted to support the scheme, as all wards in Kirkby returned Labour Party candidates into office in the May 2008 local government election. Opposers of the scheme point to overall votes (52% to 48%) to other parties and rightly claim this as a victory; however, they counted in this a newly formed political party to fight the campaign and other parties, including the Lib-Dems and Tories. All were beaten, but 1st 4 Kirkby missed out on gaining a council seat by a mere 16 votes. At the original planning committee, four Lib-Dem councillors voted in favour of the proposals. The Labour Party candidates openly supported the controversial and flawed development scheme. Alas, this was to no avail, as the Secretary of State rejected the application outright on 26 November 2009 and so ended the infamous fiasco known as "Destination Kirkby". In 2012, Knowsley Council decided to close the Kirkby Civic Suite, the towns only multi-purpose venue for theatre/dance productions, conferences, marriages & other types of events. The M57 motorway runs adjacent to Kirkby, and the M58 connects just to the north of Kirkby. Other major routes include the A580 East Lancashire Road and the A506. The area is well served by public transport, with rail connections from Kirkby railway station to Liverpool city centre (on the Merseyrail Northern Line) and Manchester (via Wigan, on the Kirkby Branch Line). Stagecoach Merseyside provide the vast majority of bus routes in Kirkby and these connect Kirkby with several nearby districts of Liverpool and Merseyside. Kirkby was planned to be the terminus of the first line of the Merseytram tram service until the scheme's termination by the Government. Educational services in the town are provided by the Knowsley Local Education Authority. The following table shows information on the secondary schools in Kirkby. Kirkby's further educational needs are provided by Knowsley Community College which supports the whole of Knowsley, including a main centre based in Kirkby town centre. It has a yearly intake of over 12,000. Kirkby also has two secondary schools and sixteen primary schools. St Chad's Church, Kirkby, St Michael's & All Angels RC Church, St Mark's CE Church, St Andrews CE Church, St Mary, Mother of God RC Church, Kirkby Baptist Church, St Joseph's RC Church, St Martin's CE Church, St Peter & Paul RC Church, Northwood Chapel, Lifegate Church and the Kingdom Hall of Jehovah's Witnesses are all within the boundaries of Kirkby. Kirkby is home to the youth academy of Liverpool F.C. (Built on the site of dissolved local club Kirkby Town's ground at Simonswood Lane). It was also the proposed new site for the new stadium for Everton F.C. which was declined in late 2009. The most popularly supported football teams in the town are Liverpool and Everton, although in the past the town had its own non-league team, Kirkby Town, later renamed Knowsley United before they were dissolved in 1997. Steve Torpey - Former Prescot Cables F.C., F.C. United of Manchester A.F.C. Telford, and Fleetwood Town F.C. Player. Notable for scoring F.C. United of Manchester's first ever goal in a friendly match against Flixton F.C. John Conteh - Boxer, 1970 commonwealth games middleweight Gold medalist. Former WBC Light Heavyweight crown holder. Paul Hodkinson - Boxer, Former WBC Featherweight Title Holder. Steve Rotheram - is a British Labour Party politician who is the Mayor of the Liverpool City Region. Policing in Kirkby is provided by Merseyside Police. The force's Basic Command Unit in the Knowsley borough has a station in Kirkby on St Chad's Drive. Public transport is co-ordinated by the Merseyside Passenger Transport Executive. Statutory emergency fire and rescue service is provided by the Merseyside Fire and Rescue Service, which has a station in Kirkby on Webster Drive. Waste management is co-ordinated by the local authority via the Merseyside Waste Disposal Authority. Kirkby's Distribution Network Operator for electricity is United Utilities; there are no power stations in the town. United Utilities also manages Kirkby's drinking and waste water. SUEZ Recycling & Recovery UK process all of Merseyside and Halton's waste at a Rail Loading Transfer Station in Kirkby. It is transported from Kirkby to Wilton in Teesside where it is used to generate electricity. The power generated at Wilton is enough to power every home in Knowsley. Kirkby is served by Knowsley NHS Primary Care Trust. Aintree University Hospital is the nearest hospital to Kirkby. There are nine GP surgeries and four dental practices. Ambulance services are provided by the North West Ambulance Service with a station based in Kirkby. The British Telecom Simonswood exchange provides local telephone and ADSL internet services to the area, with a number of other companies offering services through local loop unbundling. Virgin Media services are also available to the town, providing television, telephone and cable internet. The main local newspapers are the Liverpool Echo (evening) tabloids published by the Trinity Mirror group. There are also two main free local newspapers, the Kirkby Extra and the Knowsley Challenge. Kirkby served primarily as the basis for the fictional Newtown setting of the 1960s BBC TV series, Z-Cars, along with Seaforth. Z-Cars was one of the first soap operas on television, and featured Brian Blessed, Colin Welland, John Thaw, Joss Ackland and Judi Dench as well as Davy Jones of The Monkees. "Behind the Rent Strike", a 1974 documentary by Nick Broomfield documenting the 1972 14-month-long rent strike in Kirkby by 3000 social housing tenants in protest at the poor condition of housing in the town and the rent rises brought about by the Housing Finance Act 1972. The 1985 film Letter to Brezhnev was shot in Liverpool, including key scenes in Kirkby. The film starred Margi Clarke who was born in the town. ^ a b "What's in a name: Kirkby". National Museums Liverpool. Archived from the original on 7 January 2008. Retrieved 24 October 2007. ^ a b "Kirkby Timeline". Metropolitan Borough of Knowsley. Retrieved 24 October 2007. ^ "The National Archives – Document Search for "Cherchebi, Knowsley"". The National Archives. Retrieved 24 October 2007. ^ Ravetz, Alison (2001). Council Housing and Culture: The History of a Social Experiment. Routledge. p. 101. ISBN 0-415-23945-1. ^ a b c d "Annual Climatology for Kirkby, 30 year". The Weather Channel. The Weather Channel. 2008. Retrieved 29 May 2008. ^ a b c "Manchester Airport climate averages, 1971–2000". Met Office. Met Office. 2006. Archived from the original on 29 September 2007. Retrieved 29 May 2008. ^ a b "UK climate averages, 1971–2000". Met Office. Met Office. 2006. Archived from the original on 5 July 2009. Retrieved 30 May 2008. ^ a b c "Census profile". Knowsley Metropolitan Borough Council. Archived from the original on 22 June 2013. ^ "Knowsley Profile" (PDF). Knowsley Public Health Intelligence Team. Knowsley NHS Primary Care Trust. Archived from the original (PDF) on 12 November 2008. Retrieved 1 June 2008. ^ "Kirkby Ch/CP: Total Population". A Vision of Britain Through Time. Great Britain Historical GIS. Retrieved 1 June 2008. ^ "Proposals for Kirkby town centre". Metropolitan Borough of Knowsley. Archived from the original on 2 January 2008. Retrieved 24 October 2007. ^ "Your Kirkby Your Future – Consultation Results" (PDF). Metropolitan Borough of Knowsley. Archived from the original (PDF) on 8 January 2009. Retrieved 4 October 2007. ^ a b c Taylor, Joshua (21 January 2016). "GCSE results: How Knowsley schools performed". ^ Taylor, Joshua (15 October 2015). "Knowsley has lowest GCSE pass rate in England". ^ "Future Schooling in Knowsley - Executive Summary" (PDF). Metropolitan Borough of Knowsley. Archived from the original (pdf) on 26 September 2006. Retrieved 24 October 2007. ^ Turner, Ben (6 February 2008). "Failed school to shut year early". Liverpool Echo. Retrieved 6 February 2008. ^ "Ofsted Report & Kirkby High School Results". Kirkby High School. Retrieved 28 November 2015. ^ "Football Club History Database - Kirkby Town". Football Club History Database. Retrieved 28 November 2015. ^ "Football Club History Database - Knowsley United". Football Club History Database. Retrieved 28 November 2015. ^ "True Blue Gerry Reflects On 'Golden' Times". Wolves Heroes. 17 November 2013. Retrieved 28 November 2015. ^ "Liverpool career stats for Mike Marsh - LFChistory - Stats galore for Liverpool FC!". lfchistory.net. Retrieved 28 November 2015. ^ "Mike Marsh". Liverpool FC. Archived from the original on 20 August 2012. ^ Threlfall-Sykes, David. "Mike Marsh will depart his role as Huddersfield Town Coach at end of 2015/16 season". ^ "So Close..." Everton FC. Archived from the original on 6 January 2012. ^ "Merseyside under-16s skipper Aaron McGowan honoured to lead his county". Liverpool Echo. 24 January 2012. Retrieved 28 November 2015. ^ "Stevenage: Jamie Jones signs new terms with League Two club". 14 June 2016 – via www.bbc.co.uk. ^ "Phil Boersma". Liverpool FC. Retrieved 28 November 2015. ^ "Tommy Caton". Sporting Heroes. Retrieved 28 November 2015. ^ "Paul Cook: Portsmouth boss hopes to remain at club for "long, long time"". 16 May 2016 – via www.bbc.co.uk. ^ Hilton, Nick (29 November 2012). "Ex-Tranmere midfielder Paul Cook out to check former club's progress with Chesterfield". Liverpool Echo. Retrieved 28 November 2015. ^ "Nigel's Webspace - English Football Cards, Player Pages - Alan Dugdale". littleoak.com.au. Retrieved 28 November 2015. ^ "Ken Dugdale - Soccer - Scoresway - Results, fixtures, tables and statistics". scoresway.com. Retrieved 28 November 2015. ^ "Alan Stubbs". Everton FC. Archived from the original on 7 January 2012. ^ "Terry McDermott". Liverpool FC. Retrieved 28 November 2015. ^ "Phil Thompson". Liverpool FC. Retrieved 28 November 2015. ^ "Lambert completes Albion move". West Bromwich Albion F.C. 31 July 2015. Retrieved 28 November 2015. ^ Pearce, James (17 February 2012). "Brighton winger Craig Noone can't wait to take on his Liverpool FC heroes – and ask for Wembley tickets while he's there". Liverpool Echo. Retrieved 28 November 2015. ^ "Phil Edwards - Football Stats - Burton Albion - Age 29 - Soccer Base". soccerbase.com. Retrieved 28 November 2015. ^ "Jimmy Redfern". 11v11.com. Retrieved 28 November 2015. ^ "Gary Bennett". soapstarsoccerstar.com. Archived from the original on 28 June 2013. ^ Hilton, Nick (1 September 2014). "Tranmere Rovers have completed signing of George Donnelly from Rochdale and Matt Hill signs on one-year deal". ^ "Michelle Hinnigan". Everton Ladies FC. Retrieved 28 November 2015. ^ Jay, Phil (4 March 2013). "Boxing legends: John Conteh". World Sports News. Archived from the original on 8 July 2013. ^ "Merseyside Boxing Archive". merseyboxers.org.uk. Retrieved 28 November 2015. ^ "Robert Atherton". Knowsley Metropolitan Borough Council. Retrieved 28 November 2015. ^ "Peter Augustine Baines". New Advent. Retrieved 28 November 2015. ^ a b Ellis, James (27 October 2009). "Alan Bleasdale". Metro. Retrieved 28 November 2015. ^ "China Crisis". BBC Music. Retrieved 28 November 2015. ^ Sturges, Fiona (1 June 1997). "How We Met - Jon Savage and Margi Clarke". The Independent. Archived from the original on 2 April 2015. ^ Miles, Tina (2 September 2011). "Kirkby singer Craig Colton quit biscuit factory job for a shot at X Factor". Liverpool Echo. Retrieved 28 November 2015. ^ "Stephen Graham (I)". IMDB. Retrieved 28 November 2015. ^ "The Christians". Liverpool Music. Retrieved 28 November 2015. ^ "Tony Maudsley". IMDB. Retrieved 28 November 2015. ^ "Sharon Maughan". IMDB. Retrieved 28 November 2015. ^ "Tricia Penrose". IMDB. Retrieved 28 November 2015. ^ "Bobby Schofield". IMDB. Retrieved 28 November 2015. ^ a b c "Simonswood (LVSIM) Exchange Data". Samknows. Retrieved 27 May 2008. Wikimedia Commons has media related to Kirkby, Merseyside.